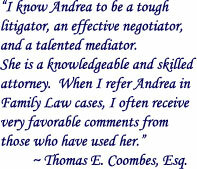 Welcome to the Law & Mediation Offices of Andrea M. Ponticiello. We are a client-oriented practice, located in Santa Rosa, Sonoma County, dedicated to effectively and compassionately guiding clients through the disorienting maze of the family law legal system. We will help you to understand the legal mandates and to determine your options. Ms. Ponticiello is an experienced Sonoma County family law attorney who will advocate for your best interests without losing sight of the emotional and financial toll the divorce process takes on you. Most importantly, we pride ourselves on placing the best interest of your children in the forefront of our concerns. We would be happy to help you to figure out whether you need an attorney, to develop an action plan, and to establish your rights under the law. Contact us for a free phone consultation to see if our services are right for you. Copyright © 2012-2018 Sonoma County Family Law, Andrea M. Ponticiello. All rights reserved.